This meatloaf is packed with flavor! It is juicy, simple and loaded with yummy ingredients! It is by far my favorite meatloaf recipe! Growing up, my mom made THE BEST meatloaf. I devour it whenever she makes it. This is her recipe and I am SO excited to share it with all of you today. 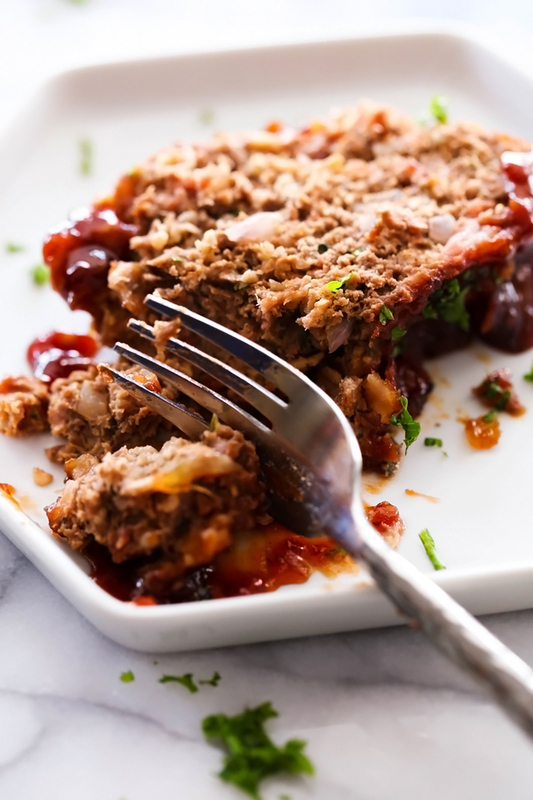 This meatloaf is packed with yummy ingredients and flavor. Everything pairs so well together for a mouthwatering bite each and every time. 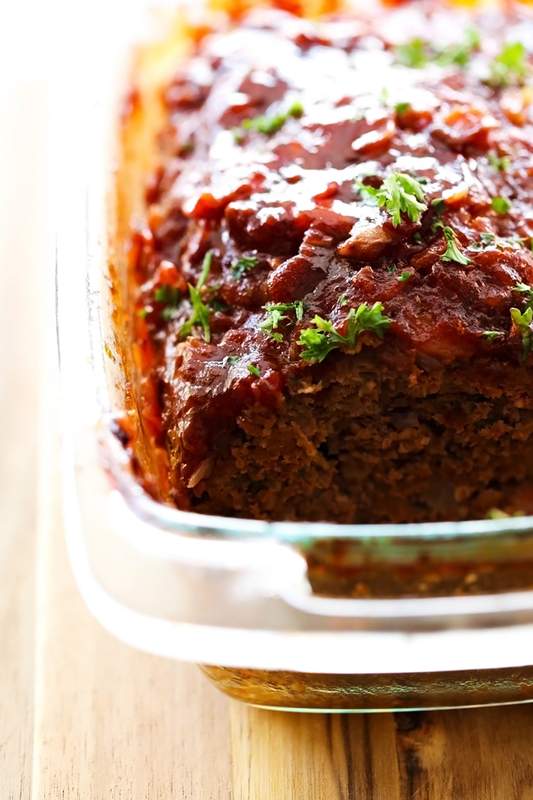 The sauce is unbelievably yummy and the meatloaf is so juicy and not dry in the slightest! There is never any leftovers when this meatloaf is made :) It can convert even thought who are meatloaf fans into a meatloaf lover! Definitely put this into your dinner rotation, you will not regret it! In a large mixing bowl, combine ground beef and bacon. In a separate bowl combine eggs, chili sauce, onion, garlic, salt, pepper, and parsley and mix until ingredients are well combined. Add egg mixture to the ground beef mixture. Add oatmeal and combine well. Spray a 5x9 inch loaf pan. In a separate bowl, combine all the ingrediants for sauce. Mix well. Pour over meatloaf. Bake at 350 degrees F for 70 to 80 minutes until meat is cooked through. 70 or 80 minutes??? I have never heard of baking meatloaf that long! I always forget how much I love meatloaf. This one looks delicious! This meatloaf looks delicious! I love a good meatloaf sandwich. I love any meatloaf recipe that has CHILI SAUCE as an ingredient. I do have a question though; the 1 CUP OATMEAL, what kind of oatmeal should be used? I have packets of instant oatmeal. Cinnamon and sugar and maple syrup. Can those be used or should I use the NON-Instant oatmeal? I can't wait to make this. Great Friday night meal. This is a wonderful recipe. My husband hates the recipe I've always used but devoured this meatloaf. So very good! Does the bacon cook enough? I made this last week and it was delicious! I did have one problem. The meatloaf just fell apart when I went to serve it. We just had to scoop it out with a spoon. Any suggestions? This meatloaf is absolutely delicious!! My entire family eats it up. Its the only meatloaf i will be making now! It comes out beautiful. Easy to slice and serve! Sometimes i use onion powder instead of f chopped onion just for convenience and its good either way. Just so tasty! Thank you!!! Due we cover with foil? Just wondering if it is kid friendly with the chilli sauce? Can we use a white sweet onion instead? Just curious? My husband loves meatloaf but loathes red onion. Thank you!! WOW...excellent meatloaf and my hubby, the gourmet chef, loved it, too! Personally, I will add mushrooms next time, but that's me. Quite perfect just the way it is! Chili sauce? Is this anything like Thai sweet chili sauce? Also, never used oatmeal in meatloaf before. Would Panko bread crumbs work instead? How do I make Chili sauce? It comes in a bottle usually found next to the ketchup :) hope that helps! This meatloaf was awesome! Hubby liked it, too! Would add a little horseradish next time, but that is personal preferance. Can you make it up and freeze it? Can I leave the oatmeal out?